From noon on Sundays, you can take a tour on the Wiri Rambler departing from outside the visitor centre. There is also a plant sale on the first Sunday of the month from 9am - 2pm just past the Herb garden. 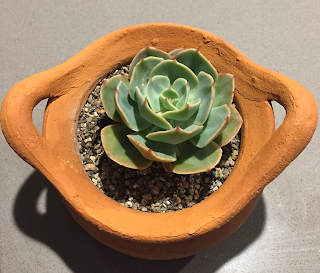 I picked up a suberb succulent for a bargain price of $5. We wandered around the lake towards the rose gardens. The sweet fragrance was reminiscent of the Yardley Rose perfume my mum wore when I was a child. We ended our visit in the African Plants garden and enjoyed the proteas, fynbos, strelitzias, and the variety of aloes on show. We will be visiting again soon as the Sculpture in the Gardens exhibition opens on 11 November 2017 and runs until February 2018. Check out their website for more events at the Gardens.